288 pages | 65 B/W Illus. An increasing number of genetically modified organisms (GMOs) continues to be produced every day. In response to the concerns raised by the development of GMOs and their incorporation in foods and feed, guidelines and regulations to govern and control the use of GMOs and their products have been enacted. These regulations necessitated the design of methods to detect and analyse the presence of GMOs or their products in agriculture produce, food and feed production chains. Design of techniques and instruments that would detect, identify, and quantify GM ingredients in food and feed will help inspection authorities to relay reliable information to consumers who might be concerned about the presence of GM ingredients. Information generated by detection of GMOs in food and feed would be helpful for setting regulations that govern the use of GM components as well as for labeling purposes. Qualitative detection methods of GM-DNA sequences in foods and feeds have evolved fast during the past few years. There is continuous need for the development of more advanced multi-detection systems and for periodic updates of the databases related to these systems. 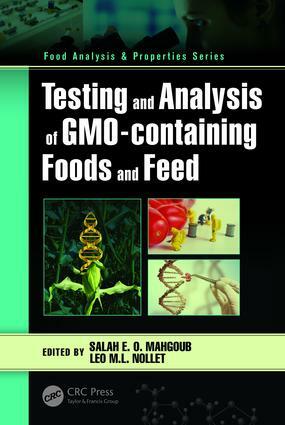 Testing and Analysis of GMO-containing Foods and Feed presents updates and comprehensive views on the various methods and techniques in use today for the detection, identification and quantification of GMOs in foods and feed. The eleven book chapters cover recent developments on sample preparation techniques, immunoassays methods and the PCR technique used in GMO analysis, the use of biosensors in relation to GMO analysis, the application of nucleic acid microarrays for the detection of GMOs, validation and standardization methods for GMO testing, in addition to the type of reference material and reference methods used in GMO testing and analysis. Some of the ISO standards designed for identifying and detecting the presence of GM material in foods are also presented in the book. Salah Eldin Osman Mahgoub is a Certified Food Scientist (CFS), Professional member of the Institute of Food Technologists (IFT,USA), and Fulbright scholar with international work experience. Has been a university professor in the university of Botswana, Botswana, university of Khartoum, Sudan and an adjunct professor at Kaplan University, USA. A critical thinker with proven experience in food science, food processing, genetically modified foods, functional foods and nutrition in relation to various consumer issues. An experienced researcher, team leader and effective team player, with proven track on developing products from the concept to the shelf and the impact on consumer preferences. Published 34 articles and conference proceedings in peer reviewed journals. Presented and participated in 42 conferences and workshops globally. Leo M.L. Nollet, PhD, received an MS (1973) and PhD (1978) in biology from the Katholieke Universiteit Leuven, Belgium. He is an editor and associate editor of numerous books. He edited for M. Dekker, New York—now CRC Press of Taylor & Francis—the first, second, and third editions of the books entilted Food Analysis by HPLC and Handbook of Food Analysis. The last edition is a two volume book. He also edited the Handbook of Water Analysis (first, second, and third editions) and Chromatographic Analysis of the Environment, Third Edition (CRC Press). With F. Toldrá he coedited two books published in 2006 and 2007: Advanced Technologies for Meat Processing (CRC Press) and Advances in Food Diagnostics (Blackwell Publishing—now Wiley). With M.Poschl he coedited the book Radionuclide Concentrations in Foods and the Environment also published in 2006 (CRC Press). Dr. Nollet has also coedited with Y. H. Hui and other colleagues several books: Handbook of Food Product Manufacturing (Wiley,2007), Handbook of Food Science, Technology and Engineering (CRC Press, 2005), Food Biochemistry and Food Processing (first and second editions; Blackwell Publishing—now Wiley—2006 and 2012), and the Handbook of Fruits and Vegetable Flavors(Wiley, 2010). In addition, he edited the Handbook of Meat, Poultry and Seafood Quality, first and second editions, (Blackwell Publishing—now Wiley—2007 and 2012). From 2008 to 2011, he published with F. Toldrá five volumes on animal product–related books.